According to a report released by the US Census in late 2018, Arizona is - in both relative and absolute terms - the fourth fastest growing state in the country. According to Wallethub.com, Gilbert is the fastest growing city in the state, and the 49th fastest growing city in the nation. Whatever your source and whatever your metric, the conclusion is the same: Arizona, and Gilbert in particular, is growing rapidly. People aren’t the only thing moving to Gilbert. The town has also been experiencing huge economic growth. Citylab.com recently named Gilbert the #1 most prosperous city in America. One blatant illustration of this growth is the Rivulon development that has been steadily materializing off of Gilbert Rd just north of the 202 highway. The development is sprouting up on a 250-acre plot of land and by the time it is done will boast over 3 million sq ft. of office space and 100,000 sq ft. of retail and hotel space. Rivulon is still under development, but it is coming closer to the realization of its final form every day. As it stands now, the space is home to multiple luxury vehicle dealerships, dozens of offices and restaurants, and a major fitness center. Elevation Marketing recently moved into their new office space at Rivulon and turned to us at Spotlight Signs to help adorn their fresh office space with interior signage. We provided them with a range of interior signs including multiple lobby signs and etched window vinyl. At Spotlight Signs, we are a one stop shop for interior office signage needs, we can provide it all: survey, design, fabrication, and installation. Elevation Marketing is a quickly growing B2B marketing agency that is based here in Phoenix. They have offices in San Francisco and now, of course, Gilbert. They work with firms of varying sizes, although 60% of their clients are $1 billion+ businesses. It is a great testament to Gilbert that such a prestigious and promising company such as Elevation Marketing would choose it as the site of its new office. As a marketing agency, Elevation obviously understands the importance of branding. At Spotlight Signs, our ultimate goal is always to be stewards of our customers’ brands. Office interiors provide an excellent opportunity to express and promote brand and Elevation Marketing took full advantage of it. We provided three separate dimensional letter lobby signs and both etched and colored vinyl window graphics. Elevation was eager to have their logo and name proudly displayed in multiple parts of their new office. Together, we arrived on a design and fabrication method that we both believed to be a great fit. The lobby signs are all made of ¼’” think flat cut aluminum with custom paint. These are stood off the wall to give a dimensional effect that is classy and interesting. The possibilities when it comes to lobby signs are many. With fabrication materials ranging from foam, to metal, to acrylic, to vinyl and so on, it is important that expertise goes into the planning for any lobby sign, and we take pride in our ability to provide that. Glass walls have becoming increasingly popular in office spaces, and although they look sleek and modern, they provide virtually no privacy. Many business do not consider this downside and it only becomes apparent once they’ve moved in. However, both etched and colored vinyl graphics can offer an interesting solution to this problem. Vinyl graphics offer privacy as well as an opportunity to brand and impress visitors to the offices. Etched vinyl mimics the look of etched glass at a fraction of the cost. At Elevation Marketing at Rivulon, we installed two vinyl window graphics on large glass walls that boast the company’s logo. One is full color, while the other is etched glass vinyl. 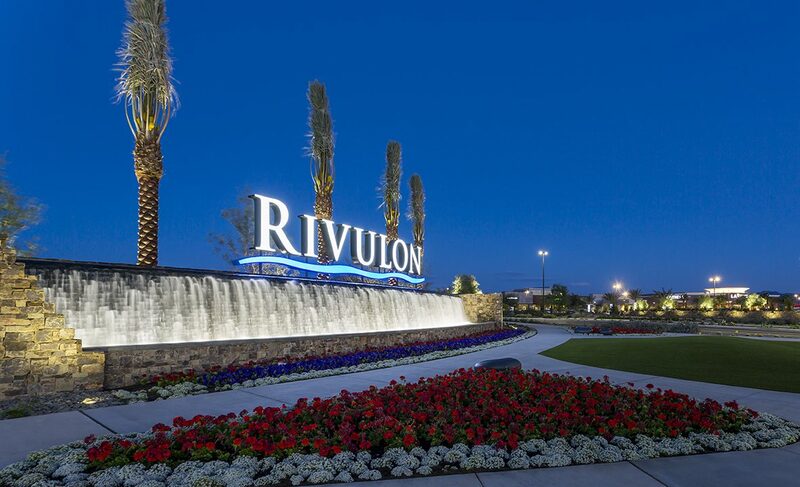 Elevation Marketing, Rivulon, and the Town of Gilbert are all on the rise. These growing entities all understand the power of branding and an attractive workspace. At Spotlight Signs, we are experts in adorning office interiors and are happy to take the time to craft ideal plans for each of our unique customers.